If you can’t find an answer to your particular question, please feel free to ask us directly using the comments section at the bottom of this page. We usually reply within 24 hours. These FAQ’s refer to the: HDAFU Tables. 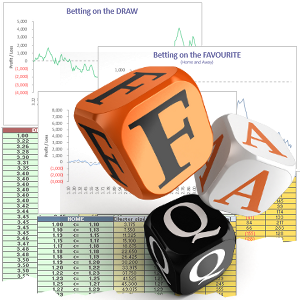 However, if you already own HDAFU Tables then you are probably more interested in our SUPPORT FAQs, as they contain a lot of tips and tricks on utilising the tables to build a successful portfolio of bets. Click on the arrows to reveal the answers. What are the HDAFU Tables? The tables are powerful Excel spreadsheets presenting a retrospective analysis of the previous five seasons’ betting results, and showing the long-term effects of backing each of the home, draw, away, favourite and underdog bet types. Unique inflection point graphs make it possible to identify the odds clusters that were/are perennially profitable. This enables the user to select a ‘sweet spot’ in the odds range to target for betting in the following season. Have you tried this method before and do you think someone can succeed with it in the long-term? Yes, and yes you can! The HDAFU simulation tables have undergone a series of expert developments since they were first launched in 2012 following our article: Home – Draw – Away: Systematic Betting. Today’s tables are focused on inflection point graphs to visualise profit and loss results trends, making it easy to spot the odds clusters to concentrate betting strategies upon, and also identifying those to avoid. Here’s a video article where Soccerwidow explains Inflection Points and employing them to find a strategy for producing long-term and consistent profits. Soccerwidow’s approach is very much an holistic one (based on the synergy of the whole rather than the performance of individual bets), which is strongly evidenced by our flagship product, The Fundamentals of Sports Betting Course explaining the art of odds calculation and the dynamics of the bookmaker market. Understanding the bookmaker business model is key to optimising any portfolio of bets and we explain in detail how to use our HDAFU simulation tables for recognising and building profitable 1X2 betting strategies from a selection of major European leagues in our article, How to Compile a Winning Portfolio. The HDAFU tables are a product of more than six years’ development and, for the seasoned punter wishing to progress to a more scientific and professional level, are an invaluable tool to help select what is worth betting on and what to avoid. Go here for a range of explanatory articles full of tips and tricks to aid your understanding of the concept behind targeted 1X2 betting. Is it really true that past statistics can be used to develop a winning strategy? Yes, this is not only true but actually the only way to develop a winning strategy. Strictly speaking, without knowledge of prior events, it is virtually impossible to predict with any degree of accuracy what is likely to happen in the future. Predicting something is already pretty difficult using just historical data (i.e. past experience) but without it, what else can a judgement be based on? The whole bookmaker business model is based around statistics and the only way of ensuring a level playing field is to use statistics too. How much do you earn based on your theories? Do you have any statistics for your betting history? For an idea of the potential of these tables please refer to the Summer League and Winter League simulations based on £100 flat stakes. The statistics for both successful campaigns are available for download in their respective articles. Why are you publishing these tables and don’t keep the secret to yourself? When Elena Schaelike founded Soccerwidow back in 2011, her aim was (and still is) to teach gamblers about bookmaker maths and market dynamics to reveal how bookmakers make money and why most most gamblers don’t. Educating gamblers to understand financial markets, training their emotions to stay in control, and teaching how to approach betting as a business and not as a casual activity are the main pillars of Soccerwidow’s ethos. The knowledge Soccerwidow provides might well be considered within betting circles as being ‘secret’, but honestly speaking, mathematical formulas and the practical use of statistics are not classified information. The cloak and dagger image of bookmakers is therefore a total myth: the mystery is nothing more than the more mathematically educated bookies making money from a mass of less educated punters. Isn’t there a risk that the system will cease to work one day? Firstly, the HDAFU Tables are not a ‘system’ per se, but they are a source of very useful information that each person will use differently. Secondly, there are many different leagues, each containing several ‘sweet’ spots (different opportunities to take advantage of). Thirdly, the tables reflect three different ‘positions’ to choose from in each league: whole of season analysis; first half of season analysis; second half of season analysis. Lastly, there are many HDAFU Table users, each employing their own favoured strategy. Combining these factors together means that there are countless variations possible. Therefore, the chances of two people selecting exactly the same leagues and then selecting exactly the same systems from those leagues is highly unlikely. The chances of each then placing exactly the same set of bets at exactly the same prices is negligible. Every individual user is different. Everyone’s attitude towards risk is different, and everyone’s tastes, preferences and choices are different. Therefore it is safe to say that every user’s ‘system’ will be different from the next. May I ask if the HDAFU Tables are so called ‘value betting’ or ‘system betting’? The HDAFU Tables have been developed to allow the user to develop a system. Therefore, strictly speaking, they fall into the category of ‘system betting’. System betting is a predetermined selection of bets that, when combined, represent a profitable betting portfolio. Systems allow the gambler to have an ‘edge’ or an ‘advantage’. Of course, any system that works well contains ‘value’, otherwise it wouldn’t work at all. System betting requires follow-through from the start to the finish of a campaign (or to a suitable closure point in profit), preferably without missing bets on any matches included in the system. For example, if the system requires the placement of 19 bets through the whole season based on a certain selection criterion (e.g. all home games of a particular EPL team), then all 19 bets really should be placed for best results! However, ‘system betting’ must not be confused with ‘value betting’. Value Betting is a totally different approach. A value bet is one where the ‘true’ chances of the individual bet winning are greater than the odds suggest. Identifying bets as ‘value bets’ involves comparing the market odds against own calculations. This approach relies on perennially choosing over-priced or under-priced bets to back or lay respectively. Contrary to system betting, value betting doesn’t require follow-through from the start to the finish of a campaign but it requires calculation of each individual match to compile a portfolio of bets for each round. With system betting, once you identify your selection criteria (= system) you simply stick to it religiously. What is the use of the inflection points? The HDAFU Tables contain inflection points graphs and these are the most powerful tools the tables have to offer. In short, they pinpoint profitable patterns. Inflection points are the points at which the curvature or concavity on a curve changes from plus to minus or, from minus to plus: Translated into layman’s language, the turning points on the profit/loss graph where profits turn to losses and where losses turn to profits. In the profit zones, it is therefore possible to identify the odds at which profits start and where they end. Bookmakers have to reduce their prices in certain odds ranges to maximise their profits. This is mainly due to a high demand from punters on certain results allowing the bookies to sell under-priced bets on a wide scale. However, as punters expect close to 100% probability when all three bets (1X2) are summed up, bookmakers have to increase their odds on the other side of the bet. For example, a bet that should have been priced for the favourite to win at odds of 1.50 (66.7%) is sold for 1.40 (71.3%): this is an ‘undervalued’ bet and guarantees the bookmaker a long-term profit and the punter a long-term loss. To ‘balance’ this discrepancy out, the bet on the underdog that should normally be priced at odds of 3.50 (28.6%) is levered up to 3.75 (26.7%): as a result this bet becomes a ‘value bet’, producing a long-term profit to the gambler. The inflection point graphs shows these turning points visually and you must remember that they are different for each bet type. Every league is also different, as is the market pressure (demand for bets) in each. For example, punters concentrating on the EPL prefer different odds clusters than those betting on the Bundesliga, and so on. Are HDAFU tables and methods to build a system also applicable to group stage competitions, such as Libertadores, Champions League and Europa League? Or even to European or World Cup Qualifiers? It should be understood that tournament or cup betting of this nature is a hugely volatile undertaking, with teams from different leagues playing each other, or club teams or national sides that have never faced each other before suddenly thrust into competition. Betting on domestic leagues is a far more stable environment, with a data set made up of plenty of teams having played each other on a perennial basis. System betting is far more suited to leagues than any other form of competition. You are showing in your articles ‘League Campaigns’ complete reports for past seasons. Can you provide me with your picks for the forthcoming and/or current next season or do I need to create a portfolio myself? Sorry, we are not a picks site and never will be. We provide all of the tools you’ll need to create your own portfolios, judge the expected returns and spread of risk, and then to select your own bets. In this way, you are in complete control of your personal campaign rather than blindly following someone else’s ‘system’. Just wondering what would happen next season in terms of updates, do you provide instructions on how to update the tables or would I be required to buy new updated tables? The HDAFU Tables do require updating on an annual basis. The oldest season’s data set is dropped and figures from the season just finished get added to retain a data set comprising the last five consecutive season’s results. Furthermore, we upgrade the tables each season, adding new tools and findings, with a constant eye on making them as straightforward and easy to use as possible. If you are an Excel wizard, then you may be able to compile your own tables, but you will not find all the information and formulas we use when compiling them in any of our completed tables. (Would you even be able to tell if your own tables were providing false results?). And of course, we know what we are doing and check everything religiously before publishing the tables for sale. We therefore recommend you buy new tables every season, or use your own at your own peril! Lastly, when buying any products from us you contribute to the further development of Soccerwidow. Any income received is used for example, to pay writers, add well-researched explanatory articles to the website, provide customer support and reply in depth to readers’ questions. The best way you can possibly support Soccerwidow is to get involved. Tailgating us (bookmark and share with your friends), cheering if you find something useful (leave a comment) and making financial donations (purchase at least one product) are all great ways to help us spend more time helping you. I am keen to get some tables. Could you please advise which three would be the best ones to start with? There is no straight answer to that question because each bettor has personal preferences or limitations regarding his/her use of different bookmakers and/or choice of leagues. To decide which leagues to buy, you’ll have to do your own homework and check that your range of accessible bookmakers/exchanges is compatible with the leagues you choose. And there really aren’t any ‘good’ or ‘bad’ choices – each league contains something of interest. Ideally, your portfolio of bets over the course of a season should be at least 500 in number in order to obtain an effective level of diversification. Depending on the leagues you have in your portfolio of bets there will be 30 to 40 betting rounds per annum, which would require on average approximately 15 bets per round. If the system is chosen properly you should be able to finish each round with a positive return but, in order to reach the 500 bets threshold, you will need several different leagues and we recommend a minimum of five leagues to begin with. But the choice is yours, dependent on your time zones, access to liquidity in your chosen leagues, and even personal experiences/taste. What is sure is that you will find a selection criteria worthwhile pursuing in every league. Sometimes there are several systems to choose from in a single league. You say that many of the smaller leagues contain the higher amount of value. Which are the best candidates to bet on? Bookmakers and punters alike tend to analyse the most popular leagues in the most depth (those with the greatest liquidity), so that markets odds are the most accurate in leagues such as the EPL and often contain little value for the bettor. Another big challenge with system betting is, that at some point the bookmakers will have adjusted for systems (if they recognise them, of course) to make them no longer profitable. This means that a formerly well-performing system may cease to be profitable in the future, which happens more often in popular leagues than in less popular ones. The less popular leagues have a tendency to contain better value not because they are improperly calculated by the bookmakers, but because there is less competition between value bettors and system bettors, and therefore less reason for bookmakers to adjust their odds. In effect, it really depends on which leagues you have access to and in which ones you would like to specialise. It’s all about diversification and we encourage you not only to focus on popular leagues like the EPL but to diversify your portfolio of bets with smaller leagues as well. Am I committing a cardinal sin by buying tables after the seasons have started? Will that disadvantage me at all? We have written an article on why it is a good decision to analyse each half of a season separately, and indeed, each HDAFU league for sale comes with three tables: Whole of season; 1st half of season; 2nd half of season. Of course, buying tables before a season starts or right at its beginning provides access to systems that can be run as whole-of-season vehicles, or 1st half of season systems. But you will find plenty of systems that are lucrative in the 2nd half of a season too. For purchasers wishing to buy tables at or after the midway point in a league’s season, although you will effectively be paying full price for half a season, our online store will automatically send you, free of charge, the full and updated (and usually upgraded) tables for the following season just as soon as they are published. This will provide you with one and-a-half seasons’ opportunities for the price of one full season. The ideal times to begin betting are at the starts of both halves of the season, but buying a table midway through the 1st half provides plenty of time to analyse for 2nd half systems, and buying during the 2nd half of a season gives plenty of time to get used to using them. Since all leagues are more or less half way through the season, I was wondering if you are selling only 1/3 of the spreadsheets as well? Let’s say I want to buy only 2nd half analysis of one of the summer leagues (with more or less 1/3 of the overall price), would that be possible? Timing your purchase is not critical as we email to all clients who bought Tables in the second half of a season the updated and usually upgraded tables for the following season free of charge just as soon as they are published. Please bear in mind that it is always helpful to see all three analyses when forming your final judgments. Please email us direct at sales[at]Soccerwidow[dot]com for quotations on all bulk order enquiries if you wish to ourchase more than 15 tables. How can I pay for the tables? I have neither a PayPal account nor a credit card. Details of alternative payment options can be found here: Payment Options. They include Skrill (Moneybookers), Neteller and bank transfer (EFT). When filling out my address details in the shopping cart order form, the field ‘State/Province’ is mandatory. I cannot see states or provinces from my country. Try pressing the F5 button to refresh your screen. Failing that, clear your cache and refresh again. If the problem persists, please contact us. What is the price equivalence in USD? To find out the exchange rate please follow this link to Google, which gives you the exchange rate of the day. I live in Italy; if I understand you correctly, the purchase price for the EPL table is therefore £35.00 * 1.22 = £42.70. Is that right? Yes, this is correct. Soccerwidow Ltd is obliged in accordance with applicable law to charge Value Added Tax (VAT) on sales of digital products and services to customers within the European Union (EU). The VAT rate applied to these products and services is based on the location of the customer (point of sale). See the current EU VAT Rates. For processing orders we use the services of GetDPD which is a fully PCI Compliant Service Provider. During the checkout process you will be offered to choose payment by Paypal or credit card. If you choose credit card, then the platform integrated with GetDPD is Stripe; here is their security documentation. As long as you have not paid there is no order. You can always return to your shopping cart and simply delete any items you don’t wish to see in your shopping cart. However, once you have paid you will get the product download link delivered immediately to your inbox. As long as you don’t download the product(s) you have a cancellation period of 14 days and the right of a full return. Otherwise, once downloaded, there are no returns for digital content. If you have made a genuine mistake, it’s worth contacting us to see if you can get a refund. Normally, we will offer an exchange for another product or supply a discount code for future purchases. As soon as you have paid you will get the product download link delivered immediately to your inbox. You will receive an email from GetDPD, our digital delivery partner. Should your download link not arrive within 10 minutes after purchasing, please check your spam folder. We do sometimes receive reports from our clients that GetDPD emails land there occasionally. You can play it safe and allow within your email program emails with the endings: digitalproductdelivery.com (GetDPD) and soccerwidow.com (us). ‘Allowing’ communications from digitalproductdelivery.com and soccerwidow.com is actually quite important because we do upgrade products from time to time and you certainly don’t want to miss the free download link we will send out to buyers. Hi! I am just writing to congratulate you on the excellent analysis on both summer and winter leagues. The material in Soccerwidow is mandatory for any serious ante-post bettor. Being a statistician, I value your product and posts in a way you cannot imagine. Thanks again! Best regards and profits to us all! Just want to share with you my results so far. I started with a 11,000 Euro bank and 300 stakes and I am 9,685 Euro in profit at the end of week 6 with week 7 in progress as we speak. Week 6 was a very bad and unlucky week with many games lost in the final minutes, but that is part of the game. I am also using the stop-loss strategy explained by Right Winger and my current bet size is 330 Euro for Week 7. And a big thanks to Right Winger and Soccerwidow for the invaluable knowledge they have taught me through this website. I had an amazing profit in the first month of the system, after which everything started to collapse, and I went negative. I stopped the system and I will tell you why. […] I realized one important thing. The balance of my portfolio was off. I was realizing all my losses are coming from medium and higher risk systems. I realized that I don't have enough low risk. […] Now I am building my portfolio around the best low risk system I can find, and not the other way around. […] If a portfolio is suffering from medium/high odds negative streaks, counter-balancing it with more low risk system can save your profits. Good luck and stay positive! When I was going through that bumpy ride in my Summer campaign, I was asking myself, does it really work? […] Then I had brief success and thought, yes, this is working! During that 3.5 months struggle, I was in doubt and good mood multiple times. This is natural thinking of human kind, when matters go well, we think everything is fine, once something starts going against us, we may become mentally shaky. […] Put emotions aside before you change anything, think over what good and bad those changes would bring you when strategy is having bad and good times, also, changes or no changes can turn back against or go along with you at any time. […] Eventually, if you have an edge against bookmakers and "right" portfolio, in the long run winning systems will recoup all the losing systems. It remains to say what we endure now, we are doomed to face these kind of situations, unfortunately. Just be persistent and work to the end, there is no other way to be a winner in the long run. In the interests of balance, my summer league campaign ended up returning an 800% profit on the cost of the spreadsheets (at a flat £25 per bet). My winter league is now breaking even having been 36 points down at its lowest ebb. It's performing much more reliably now. I fully intend to purchase a full suite of sheets for the next summer leagues.